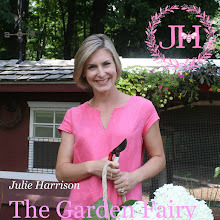 Julie The Garden Fairy: Gardeners, Get Vertical! I first published this post about GroVert in the spring. Fast forward a couple of months and POW! Holy smokes am I impressed with this garden 'gadget'! Today on Better Connecticut Scot Haney and I checked in on my GroVert filled with herbs. It has done far better than I ever imagined. Until the station posts the video clip from today, the picture above is of my GroVert, herbs-a-plenty. A couple of years ago I stumbled upon The Earth Box growing system- it was the easiest growing system for tight spaces… I think Neil Armstrong might have used one on the Apollo. Of course I have a new must-have for 2012: The GroVert! It is a vertical growing system that you can hang on a wall inside or outside of your house, or just about anywhere with a vertical plane. There are unlimited possibilities to get vertical with your gardening. I planted mine with herbs for the kitchen, at least for now. I plan on changing it out with something more colorful later in the season. to watch how I planted my GroVert. (My apologies for the poor sound quality, we experienced some mic issues during the shooting of this story) Already my herbs are starting to fill in, I will post a pic of my GroVert of herbs in another week. I found the GroVert at Revay's Garden and Gift Shop in Broadbrook, Connecticut. They had some already planted with bright Primrose and Ivy and another with low light requirement houseplants. I love the hot, juicy colors that they used. This season you will be seeing a lot of the GroVert- they are just so easy and fun, I think everyone should have one- or six! If NASA hasn't already, they should consider using this on an upcoming mission. Gardening possibilities to infinity and beyond!! !